Most of the information on this page has been gathered from internet searches and brass band related publications. If anything on this page is wrong or if anything has been omitted, please do get in touch and I will be happy to correct or add anything relevant to the history of the City of Bristol Brass Band. Bristol has seen many bands come and go (recorded history shows over 30 bands) with the earliest band existing around 1850. Many different bands played at the opening of the Clifton Suspension Bridge in 1864. 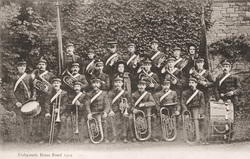 In Fishponds, the earliest record of a band is in 1904 with this photo (right) simply labelled "Fishponds Brass Band 1904". Another record shows that the Fishponds Argyle Band played at the Festival of Brass Bands in the Colston Hall in 1933 with many other local bands. 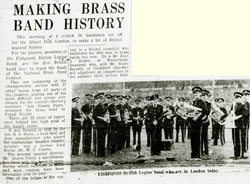 The City of Bristol Brass Band was formed in 1936 as the Fishponds British Legion Band by HS Perry (a local boot and shoe manufacturer who also played the euphonium) and William George Cozens (Lord Mayor of Bristol in 1959). Throughout the Band's history they have performed at many venues across the length and breadth of the UK. One of their most successful periods was during the 1960's, when they competed at the Royal Albert Hall in the National Brass Band Championship Finals on three separate occasions. During this time the musical director was Alwyn G Lloyd (who conducted from 1949 until the early 1970s). He made history by taking the first band based in Bristol to the National Finals in 1961. Alwyn G Lloyd took the Band to the National Finals again in 1964 and 1968. The Band changed their name in the mid 1960's when their success had created questions from its audience of the whereabouts of 'Fishponds'. 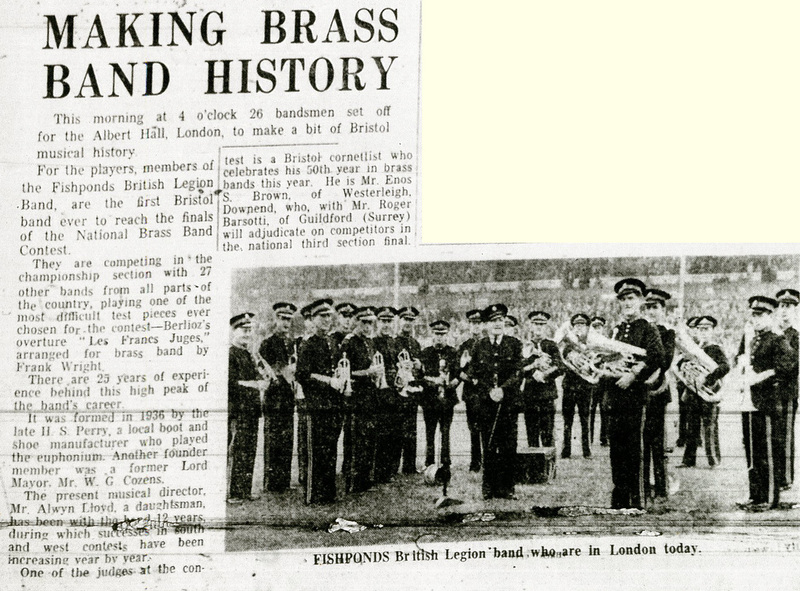 From then on the Band has performed under the name of its city of origin - 'The City of Bristol Brass Band'. After Alwyn G Lloyd left the Band, there is a gap in the records of 15 years during which time the Band dropped down through the sections. In 1986 the Band once again competed in the West of England Areas. For six years the Band was conducted by T. Webb. From 1994 P. Vann took the Band and they saw a win in the 4th section at the 1995 Areas. He saw the Band promoted to the 2nd section and in 1998 Bryn James took over the baton. Bryn has an undeniable record of winning in competitions and promoted the Band into the championship section by 2004. The highlights of his reign were the 2nd Section, 2nd place at the Areas in 2001 and winning the areas in 2003 in the First section. Andrew Jones took the healm for a couple of years from February 2004 while the Band was in the top section. After a brief hiatus where the Band was unable to compete, they made a return in 2008 in the first section under Ian Holmes (former bass player of Sunlife / Stanshawe Band and current MD of Lydbrook Band). From 2009 the Band competed under Ceri Thomas (former cornet player of Cory) in the Second section. In that year, the Band became the South West Brass Band Association and Gloucestershire Brass Band Association Champions and came second at Weston-super-Mare. The Band went on to win the GBBA again in 2010 and 2012, as well as the Leicestershire Brass Band Association in 2012. 2014 saw the Band flourish under Kev Robbins (also a former player of the Sunlife Band) and in November of the same year the Band welcomed Bryn James back to take over the baton. In late 2017 Paul McLaughlin took over the role of MD. The Band currently competes in the first section, having gained a promotion from January, 2018. The current MD (from late 2018) is Ian Holmes. For more information about the City of Bristol Brass Band's contest results, the Brass Band Results website is very useful. 4BarsRest, 13th April, 2004: City of Bristol go live!